It is official, and the announcement we’ve all been waiting for… the OUTLANDER TV series will debut in the U.S.A. on Saturday, August 9, 2014 at 9 p.m. (Eastern and Pacific time zones) on the Starz cable network. The network released the news on Thursday, May 8. Sixteen episodes — which comprise the first season of the series — are currently being filmed on location in Scotland. The scripts for the first two episodes of the series were written by Executive Producer Ronald D. Moore (“Battlestar Galactica,” “Star Trek: Deep Space Nine,” “Star Trek: The Next Generation”), and were directed by John Dahl (“Dexter,” “Breaking Bad,” “Justified”). Will the TV series be true to Diana’s books? Yes! Of course, adapting a complex novel to a visual medium will cause some changes, but Moore has promised Diana’s devoted readers that the series will remain as faithful to her books as possible. A talented writing team has been assembled to adapt Diana’s story into the sixteen episodes in the first year of the series, working closely with Moore. Will the series be continued to a second year? If the ratings are good and viewers watch, the Starz network and the other partners could decide to keep going with another year. Or more! 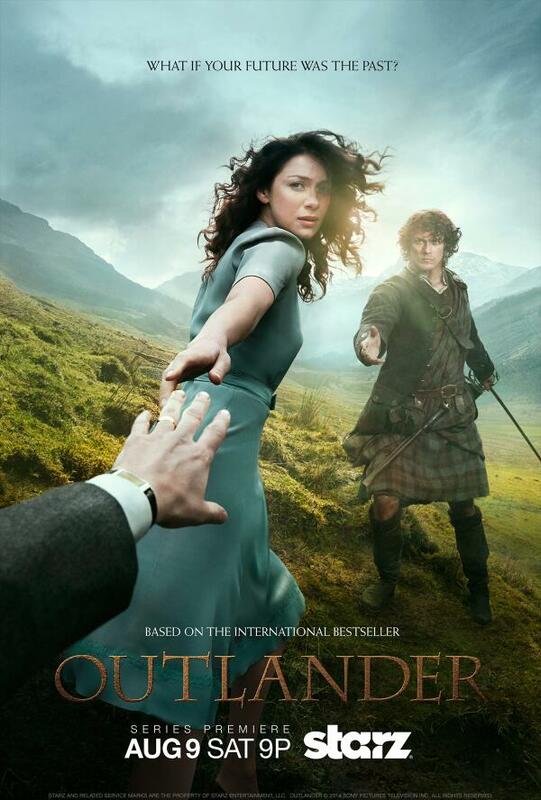 The poster depicts Claire (Caitriona Balfe), a married British combat nurse from 1945 who mysteriously falls back in time to 1743 Scotland, where she is torn between her husband Frank Randall (Tobias Menzies) and Jamie Fraser (Sam Heughan), a Scottish warrior who comes to her rescue. The image represents Claire’s physical and emotional journey. At the start of the series, she is a woman who has been transported into the past, but she’s reaching back and trying to stay connected to the life and husband that are now beyond her reach. Starz collaborated with The Refinery and photographer Frank H 3 to create the key art which was shot on location in the Scottish Highlands. For more information, go to the official Starz Outlander Facebook Page and follow @Outlander_Starz on Twitter and Instagram. Join the conversation with #Outlander and #STARZ. The Starz network, who produces the series, has the rights to broadcast the series in the U.S. If you aren’t in the U.S.A., and the series becomes available in your area, you will view the series on another network, which will vary by country or region. The negotiating of international rights to a series is VERY complicated and time consuming. Diana discusses this in her May 9 blog. Sony has the broadcast rights to the series outside the U.S., and is working to negotiate and sell the rights to each country or viewing area individually, which takes time. As of May 9, we know that Showcase will show the series in Canada, and Foxtel SoHo will broadcast it in Australia. No premiere dates for either network have been released yet. We will add information to Diana’s web pages about which networks will broadcast the TV series as it becomes available. Also, check the Starz home page for the series. Click here to read Diana’s news page for the Outlander TV series, which lists selected articles in the news media by date. The OUTLANDER TV series is based on the book of the same name, the first major novel by Diana Gabaldon, the first in a multi-book series. The seven major novels in Diana’s OUTLANDER series have sold more than 25 million copies worldwide and have graced the New York Times best-seller list six times. The eighth major novel in the OUTLANDER series, WRITTEN IN MY OWN HEART’S BLOOD, will be released in the U.S.A. and Canada on June 10th, 2014. Diana will embark on an international book tour to promote the book on June 11. Visit Diana’s Appearances page to see if she is coming to your area. This page written by Loretta, Diana’s web mistress, on May 8, 2014. It was last updated on Sunday, May 10, 2014 at 10:25 p.m.